Efforts to make things better are persistently blocked by a bottleneck. Now what? 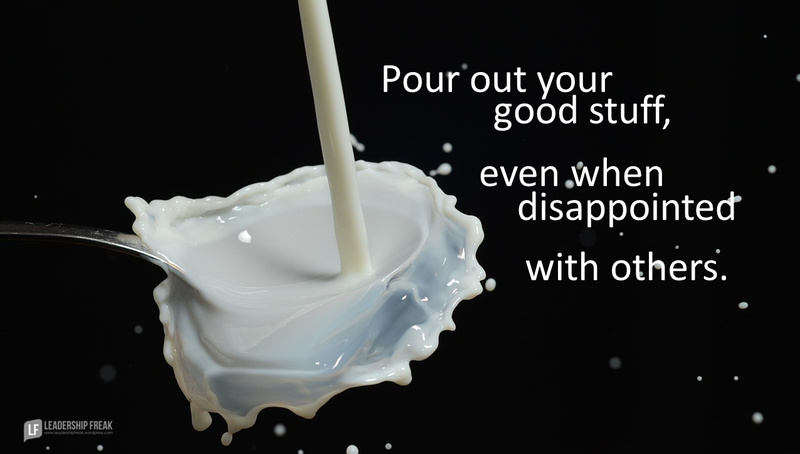 Pour out your good stuff, even when disappointed with others. Follow the good in your heart. Accept their power. One person has the power to hinder an entire organization. Bottlenecks should care, but don’t. Why don’t they care? Higher-ups should do something, but don’t. Why don’t they do something? Mediocrity prevails, when things could be better. Why can’t we change things? Stay positive. Breaking a bottleneck is frustrating. Frustration tells you what you don’t want. Focus on what you want. Don’t expect higher-ups to intervene if your bottleneck has been around for a long time. Don’t expect hardened bottlenecks to radically change. Get on their team as much as possible. Clarify the “good” you desire. Is it really good for your organization and customers or are you being selfish? What will be better, if you push through? Inform yourself. Perhaps you’ve missed something. Go around, if the direct approach hasn’t worked. Take small actions without them. Be prepared for confrontation. Hardened bottlenecks don’t like being stretched. Stay humble and open, especially when your bottleneck has position and authority. Remember, you could be wrong. If confronted, kindly tell the whole truth. If you are punished for working to make things better, so be it. One person can make things worse – one person can make them better. What does kindness and courage look like when dealing with bottlenecks? What warnings or suggestions might you offer someone who is dealing with a bottleneck on their team? Thanks, Dan. Pastors encounter hardened bottlenecks in church quite frequently. I have certainly had my share in the past. Several of your 10 tips resonate with me, especially #9. Remaining open and inquisitive helps a lot! Excellent! Be the influence of change no matter how long it takes. Bottlenecks can disrupt the morale of the whole team so it’s important for you to lead them in a healthy way. The more people you are positively influencing, the more likely that bottleneck will not be around for a long time. Stay patient and stay the course. I would acknowledge their position in the organization and stay friendly. What could help as well is to find someone else in the organization who has influence on the bottleneck. This is not necessarily the boss of the bottleneck #influencialmanagement! Love this post Dan! In my last position, I found I had to “go around” so often that I eventually looked up and realized I was in a completely different (metaphoric) place than my leader and my co workers. That’s when I knew it was time for me to be in a literally different place and move on to a position that was a better fit. Erin, the same happened to me. By leaving I got more independence, a raise and a greater challenge. Fortunately for my old organization, the powers that be saw what was happening and made a drastic change for the better. Everyone won but the bottleneck. Dan, Acknowledge that somethings may not change if they have lingered for a long time. All the responses today are spot on! Steady pressure would be my methodology to the bottlenecks, if things don’t change go around with alternative pathways if they exist to other individuals who may control the situation, spell out a solution to why the bottleneck exist and offer positive outcomes if we circumvent the bottleneck! Last but not least move on, as some things aren’t meant to be! ( Not my preferred way to quit), more like try and try again! I needed this post. My organization went from open idea exchange to tunnel vision yes men. Our new executive likes to make the big decisions without input and has no empathy for the road blocks faced by front line supervisors.